“Gal” is another word for “girl”. “Buffalo” is a city. First, listen to the song and figure out the words. Once that’s done, you are going to do a dance. The principle is this: when certain words are phrases are sung in the song, members of the class take a certain action. Let’s start with the chorus. For the instrumental section after the opening chorus, all you do is clap your hands, just as instructed in the song. There. Now let’s practice the chorus and the clapping section which follows. The song goes very fast, so let’s not listen to the audio file just yet. Let’s start by just speaking the words with the class and doing these actions. Remember, “come out” repeats three times so we’ll have to do the action three times. Great. Next let’s take the verse. a hole in her stockin’ = lift your right leg and point to the sock (where you might have a hole). heel kept a rockin’ = lift your heel and rock it, i.e., swing it back and forth from left to right. Okay, now it’s time to try it with the group. Do it slowly, just speaking the words. Remember to draw the “moon,” which comes at the end of the chorus AND the verse. Now, if you feel the class can make these moves, you might try it with the audio which is pretty fast. If the group succeeds, congratulations! You have performed the easy dance. You’ll find adding these two extra moves makes the dance more challenging and more fun. It’s a workout. Of course, these movements are just suggestions. You may make up your own. 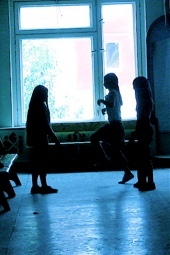 Or better yet, allow students to make up – and then explain to the rest of the class – their own dances. The Buffalo Gal Chorus features Chelsea, Max, and Kristin Venuti.